Our Partner, John Sze, conducted an in-house seminar for the Wartsila group of companies in Singapore on 22 April 2014. The topics centred on issues arising from contracts, sale of goods as well as negligence and misrepresentation. The seminar was attended by about 30 people, most of whom handle commercial and/or legal issues on a regular basis. This led to a lively discussions and interaction with the audience, as well as sharing of experiences. The seminar was very well received, and we already been asked about organizing the next session! 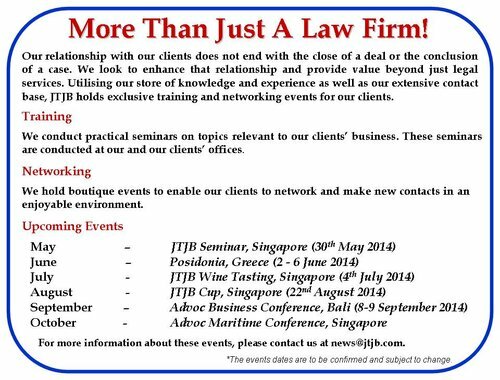 JTJB conducts seminars on relevant topics for your staff at your office. For enquiries, please email us at news@jtjb.com. JTJB LLP will be participating in Posidonia from 2 – 6 June 2014 in Greece as part of the Singapore Pavilion. Posidonia is one of the world’s most prestigious maritime exhibitions and is well known to the international shipping community. To all our friends and clients who will be in Athens at the time of the exhibition, please do visit us at stand 2.401D in the Singapore Pavilion. 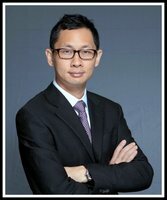 JTJB is a boutique full service Singapore law firm. For more information about our Firmand our services, please contact us at info@jtjb.com. JTJB is celebrating over 25 years in practice. Visit our website at www.jtjb.com.